Throughout the world, patients with chronic diseases/illnesses use complementary and alternative medicines (CAM). The use of CAM is also substantial among patients with diseases/illnesses of unknown aetiology. Chronic fatigue syndrome (CFS), also termed myalgic encephalomyelitis (ME), is no exception. Hence, a systematic review of randomised controlled trials of CAM treatments in patients with CFS/ME was undertaken to summarise the existing evidence from RCTs of CAM treatments in this patient population. Seventeen data sources were searched up to 13th August 2011. All randomised controlled trials (RCTs) of any type of CAM therapy used for treating CFS were included, with the exception of acupuncture and complex herbal medicines; studies were included regardless of blinding. Controlled clinical trials, uncontrolled observational studies, and case studies were excluded. A total of 26 RCTs, which included 3,273 participants, met our inclusion criteria. The CAM therapy from the RCTs included the following: mind-body medicine, distant healing, massage, tuina and tai chi, homeopathy, ginseng, and dietary supplementation. Studies of qigong, massage and tuina were demonstrated to have positive effects, whereas distant healing failed to do so. Compared with placebo, homeopathy also had insufficient evidence of symptom improvement in CFS. Seventeen studies tested supplements for CFS. Most of the supplements failed to show beneficial effects for CFS, with the exception of NADH and magnesium. The results of our systematic review provide limited evidence for the effectiveness of CAM therapy in relieving symptoms of CFS. However, we are not able to draw firm conclusions concerning CAM therapy for CFS due to the limited number of RCTs for each therapy, the small sample size of each study and the high risk of bias in these trials. Further rigorous RCTs that focus on promising CAM therapies are warranted. Throughout the world, patients with chronic diseases tend to be high utilisers of health care resources and/or the health care system. Such patients are also frequent users of Complementary and Alternative Medicine (CAM) services, which are present either within or outside the National Health Service. The reasons for using CAM are diverse; however, hope, engagement in one's own health and positive expectations of treatment efficacy are nearly always present. Patients with chronic fatigue syndrome (CFS) are no exception. CFS is a challenging illness for patients, as well as those close to them, health care providers and society in general. Western medicine usually has potent treatments readily available for diseases with a single cause and a well-described pathophysiology. However, as of yet, no single cause of CFS has been discovered, although potential factors, which are still questionable, have been identified [1–3]. Several treatments for this condition have been explored; however, none has shown persistent or consistently significant outcomes in this patient population [4–6]. Although several CAM treatments for CFS patients were described in a previous review, the review only included literature up to April 2007 . Furthermore, a new quality assessment tool (the Cochrane risk of bias tool) has since been proposed to enhance the validity of systematic reviews . 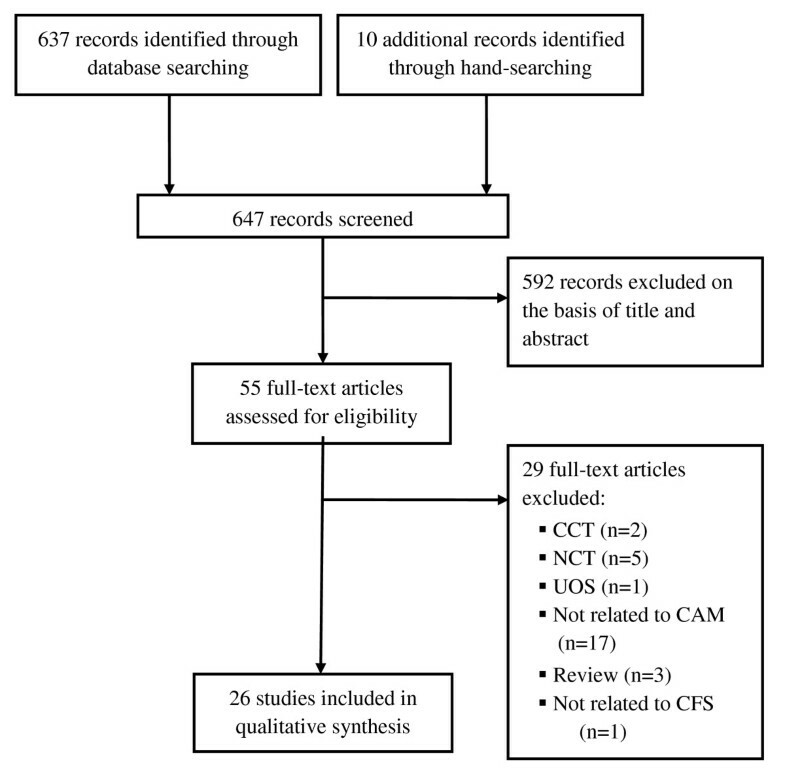 Therefore, the aim of our review was to systematically summarise and critically evaluate the data from RCTs of CAM treatment for patients with CFS. We searched the following electronic databases up to 13th August 2011: Medline, PsycInfo, Alternative Medicine (AMED), the Cumulative Index to Nursing & Allied Health Literature (CINAHL), EMBASE, and the Cochrane Library 2011 (Issue 5). We also searched the Chinese databases (China Network Knowledge Infrastructure (CNKI; 1979-2010), the Chinese Scientific Journal Database VIP (1989-2010), the Wan Fang Database (1985-2010), and the Chinese Biomedicine (CBM) database (1978-2010); the Korean medical databases (including Korean Studies Information, DBPIA, Korea Institute of Science and Technology Information, Research Information Service System, KoreaMed, and National Assembly Library); and Japanese databases (Japan Science and Technology Information Aggregator, Electronic). The search strategy is listed in Additional file 1. In addition, we manually searched our own files, Focus on Alternative and Complementary Therapies and Forschende Komplementärmedizin. The references in all located articles were also searched. All randomised controlled trials (RCTs) of any type of CAM therapy, with the exception of acupuncture and complex Chinese herbal medicines, for the treatment of CFS were included, regardless of blinding or the published language. Cochrane reviews of trials testing acupuncture type therapies  are ongoing, and as a result, this topic was excluded. We included RCTs that tested a single herb for CFS. RCTs testing complex herbal medicines for CFS were excluded, as it is not possible to isolate the effects of single herbs. Trials were included if they used CAM as either the sole treatment or as an adjunct to other treatments, which occurred in cases where the control group also received the same concomitant treatments as the CAM group. Studies comparing two different forms of CAM and those in which no clinical data were reported were also excluded. Cognitive behavioural interventions were not considered to be a part of CAM and were therefore excluded. If cognitive behavioural intervention was used as a control, the trial was included. Trials that employed CAM as the sole treatment or as an adjunct to other treatments were included. Dissertations and abstracts were included if they contained sufficient detail for critical evaluation. Hard copies of all articles were obtained. All articles were read, and data were extracted from the articles based on predefined selection criteria by two independent reviewers (MSL and TYC). To evaluate the methodological quality of the RCTs, the risk of bias was determined using the Cochrane classification for eight criteria: random sequence generation, allocation concealment, patient blinding, assessor blinding, reporting of dropout or withdrawal, intention-to-treat analysis, selective outcome reporting and other potential biases . We screened 647 relevant articles, and 592 were excluded, leaving us with 55 full-text eligible articles. Of these, 29 more were excluded. The remaining 26 RCTs met our inclusion criteria (Figure 1). Key data from these studies are summarised in Tables 1 and 2[10–35]. The RCTs included in the table employed the following treatments: mind-body medicine (4) [10–13], massage (2) [14, 15], tuina and tai chi (1) , homeopathy (2) [17, 18], ginseng (1) , nicotinamide adenine dinucleotide (NADH) (2) [20, 21], and dietary supplements (14) [22–35]. A placebo procedure was employed in 16 trials [17–20, 22–27, 29–34]. Twenty of the included trials adopted a two-arm parallel group design [10–12, 14, 15, 17–27, 29, 30, 33, 35], three adopted a three-arm parallel group design [16, 28, 34], and one used a four-arm parallel group design , while two trials employed a cross-over design [31, 32]. Nine trials adopted the CDC criteria for the diagnosis of CFS [11, 20, 22, 24, 25, 27, 28, 31, 32], five studies diagnosed CFS according to the criteria published by Fukuda [10, 15, 16, 19, 21], five used the Oxford criteria [12, 17, 18, 30, 35], two combined with Fukuda and Oxford criteria [13, 23], and one used a different classification system . (A):9,(B):6,(C):12 diarrhoea, cystitis, bronchitis, arthritic pain, back pain, asthma, abdominal pain, insomnia, constipation, gastroenteritis, diffuse pain, sinusitis, headache, renal coli, vertigo, pharyngitis, tracheitis. CDC: Centers for Disease Control and Prevention; CESD: Center for Epidemiological Studies Depression Scale; CFS: Chronic Fatigue Syndrome; CGI: Clinician's Global Impression Scale; FIS: Fatigue Impact Scale; FLP: Functional Limitations Profile; HADS: Hospital Anxiety and Depression Scale; MBSR: Mindfulness-Based Stress Reduction; MFI: Multidimensional Fatigue Inventory; n.r. : not reported; NS: Not significant; RVI: Rand Vitality Index; NADH: Nicotinamide adenine dinucleotide; QoL: Quality of life; SF-36: Short Form 36; VAS: Visual Analogue Scale; WHOQOL-BREF: WHO Quality of Life-BREF. *, Domains of quality assessment based on Cochrane tools for assessing risk of bias. †, Two domains referring to 'incomplete outcome data' in the Cochrane tools for assessing risk of bias. ‡, This study had a baseline imbalance in the subjective outcome values. Abbreviations; Low (low risk of bias);/High (high risk of bias); Unclear (uncertain risk of bias). The risk of bias in the studies was variable. Eleven RCTs had an adequate method for random sequence generation [10, 11, 13, 15, 17, 19, 24, 25, 28, 29, 33], whereas the remaining 15 RCTs did not [12, 14, 16, 18, 20–23, 26, 27, 30–32, 34, 35]. Allocation concealments were adequately performed in 13 RCTs [10, 11, 13, 17, 19, 24, 25, 29–33]. Patient and assessor blinding was reported in 16 of the RCTs [17–20, 22–27, 29–34], whereas two RCTs employed assessor blinding only [10, 11]. Reasons for dropouts and withdrawals were fully described in 17 trials [10, 11, 13, 17, 19, 22–26, 28–30, 32–35]. With respect to the intention-to-treat (ITT) analysis, 11 RCTs did not report the basis of the analysis [11, 12, 14–16, 28, 30–32, 34, 35], and 9 were analysed on a per-protocol basis [10, 13, 18, 20, 21, 23, 25–27]. The remaining 6 studies employed the ITT method [17, 19, 22, 24, 29, 33]. Eleven RCTs had a low risk of bias in selective outcome reporting [11, 13, 14, 17–19, 21, 23, 25, 29, 33], and the others had a high risk of such bias. Two RCTs compared qigong plus meditation with no treatment [10, 11]. Both studies reported beneficial effects of qigong with meditation on fatigue. One RCT tested Mindfulness Based Stress Reduction (MBSR) as compared with a wait-list control and found significant effects of the treatment on anxiety . The other RCT compared distant healing with a four-armed partial blinding, placebo-controlled design and did not show a significant effect on mental or physical components of quality of life . Two RCTs tested massage compared with Sham TENS or another type of massage [14, 15]. One RCT demonstrated the beneficial effects of massage on several symptoms of CFS, including depression, fatigue, pain and insomnia . The other RCT compared a special type of massage (Intelligent-turtle) with general massage and reported some effect of this type of massage on physical symptoms . One RCT tested tuina and tai chi as compared to fluoxetine . The tuina group had more symptom reduction than the fluoxetine group fluoxetine, but there were no significant differences between tuina and tai chi or tai chi and fluoxetine after 1 month of treatment. The effective rate was decided by the practitioner and was based on symptom improvement, which was not described in detail. Two RCTs compared homeopathy with placebo [17, 18]. One RCT showed that homeopathy improved fatigue and function . The other RCT reported the beneficial effects of homeopathy on symptom improvement . One RCT tested Siberian ginseng and failed to show the effectiveness of ginseng on the Rand Vitality Index . Two RCTs compared NADH with placebo or psychological therapy [20, 21]. One RCT showed statistically significant effects of NADH (10 mg) on symptom scores when compared with placebo after 1 month of treatment . The other RCT also reported the positive effects of NADH (from 5 to 10 mg) when compared with psychological therapy (not reported in details) after 3 months . Six RCTs compared several types of general food supplements with a placebo control [22–27]. Five of these RCTs failed to show significant effects of dietary supplements on symptoms of CFS when compared with placebo. One RCT compared acclydine with placebo and showed the beneficial effects of acclydine on clinical improvement at weeks 4 and 8 . One RCT tested Acetyl-L-carnitine as compared with Propionyl-carnitine and combined both therapies . The results showed the beneficial effects of each therapy on fatigue, pain and attention/concentration. Two RCTs compared essential fatty acids (Efamol Marine-evening primrose oil) with placebo [29, 30]. One RCT showed the possible efficacy of essential fatty acids on symptoms and general heath , whereas the other RCT failed to show an impact of this therapy on physical symptoms and depression when compared to placebo . One RCT compared liver extract-folic acid-cyanocobalamin with placebo and failed to show an effect for the treatment . The second RCT compared antioxidant treatment with placebo and reported beneficial effects in the treatment group; however, there were no reports on intergroup differences . The third RCT compared a magnesium supplement with placebo and found beneficial effects of magnesium on patients' symptom profiles . A large, double-blind RCT of patients with CFS investigated the effect of isobutyryl-thiamine disulphide. No improvements were observed when compared with placebo . When melatonin was compared in an RCT with phototherapy, neither intervention generated beneficial effects . Five of the 26 included studies reported no adverse events or a slight occurrence of them [16, 20, 24, 31, 34], whereas the remaining 20 studies lacked descriptions regarding the occurrence of adverse events. Our analysis shows that a range of CAM studies have been conducted to determine which therapies might ameliorate CFS symptoms. There is insufficient evidence to conclusively determine efficacy. Studies of qigong, massage and tuina have demonstrated positive effects; however, the nature of the control group and the quality of the studies prevent us from concluding that those CAM therapies are effective for CFS. Compared with placebo, homeopathy also had insufficient evidence of symptom improvement in CFS. Seventeen studies tested supplements for CFS. Most of the supplements failed to show favourable effects for CFS, with the exception of NADH and magnesium. However, the total number of RCTs and the total sample size were too small to draw firm conclusions. Our review aimed to update and complete the evidence of CAM treatments for symptom relief in patients with CFS. Compared to a previous review , we identified 3 new types of CAM and 9 new RCTs and successfully updated the evidence for these therapies in CFS. The results of our review are similar to that of the previous review , which also expressed concern regarding the poor methodological quality of the included primary studies . Another two published reviews concerning traditional Chinese medicine and herbal medicines were unable to find appropriate studies to review [36, 37]. Most of the included trials had a high risk of bias in many domains. Low quality trials are more likely to overestimate effect size . This is also true for trials with inadequate blinding and inadequate allocation concealment, as such trials are more subject to selection bias and are likely to generate exaggerated treatment effects [38, 39]. Several trials used an inadequate method for sequence generation. Because inadequate sequence generation in randomisation studies also tends to yield a larger estimate of treatment effects, this is another source of potential bias. One argument for using CAM for the management of CFS might be that it causes fewer adverse effects than drug treatment. Only five RCTs [16, 20, 24, 31, 34] assessed the adverse effects of CAM treatment, while 21 RCTs did not. No severe adverse effects of CAM were noted. However, adverse effects should be assessed in future CAM trials. This is an important factor for patients, as CAM treatments are generally offered outside of the official health care system. Our review has a number of important limitations. Although strong efforts were made to retrieve all RCTs on the subject, we cannot be absolutely certain that we succeeded. Moreover, selective publishing and reporting are other major causes for bias, which must be considered [40, 41]. It is conceivable that several negative RCTs remain unpublished, thus distorting the overall picture [40, 42]. Further limitations include the paucity and often suboptimal methodological quality of the primary data. Together, these factors limit the conclusiveness of this systematic review considerably. 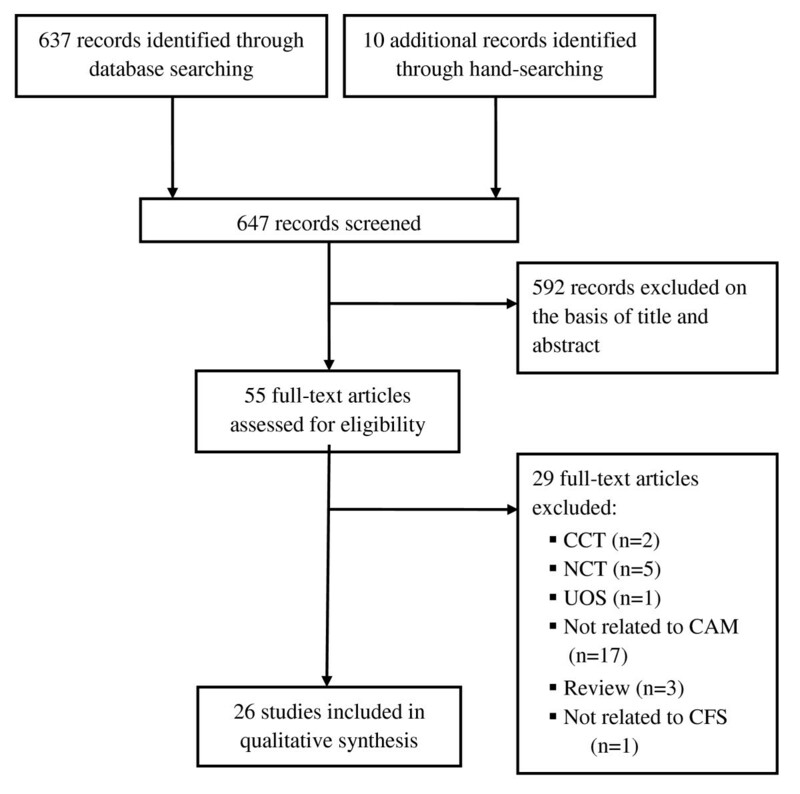 The results of our systematic review provide limited evidence for the effectiveness of CAM in treating patients with CFS. However, the total number of RCTs included in the analysis, the total sample size and their risk of bias were quite high in several domains; thus, drawing firm conclusions concerning the effectiveness of CAM therapies remains difficult. Further rigorous RCTs that can overcome the many limitations of the current literature are warranted. Terje Alraek, Myeong Soo Lee contributed equally to this work. TA obtained funding for the study, conceived and participated in its design and coordination and helped to draft the manuscript. MSL conceived and participated in its design. MSL and TYC searched databases, extracted and assessed studies. They also helped to draft the manuscript. HC participated in the study design and helped to draft the manuscript. JL conceived the study, and participated in its design and helped to draft the manuscript. All authors read and approved the final manuscript.